Yesterday I visited Goodwill again. I think I need to go at least once a week! 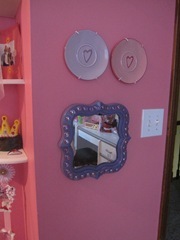 This time I found a few cute items to use around the house, but my favorite find was this mirror for 2.99. This is what it looked like when I found it. 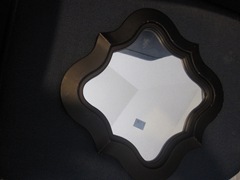 It was one of 3 in a variety of shapes, but I only purchased the one. 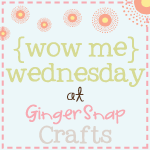 I knew right away what I would do with it and after a quick stop at Michaels I got started on my newest project! 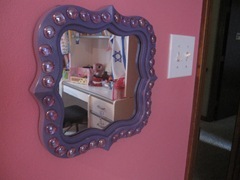 First I removed the mirror – it was screwed on in the back – and I painted it purple. 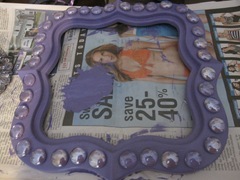 Then I glued purple gem stones around the frame. 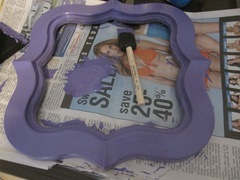 I cleaned up the mirror with windex and let the frame dry overnight. 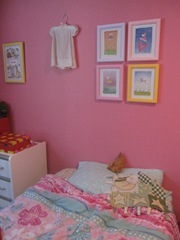 Then put it back together and hung it up in Gabbie’s room! The frames were white, but I painted them!